A food tasting tour to make you green with envy! A relative newcomer on the the global food scene, matcha, more commonly known as green tea powder, has quickly captured the culinary world by storm and proven it is not just a fad. Long established in Japan, this potent powder has roots in the traditional tea ceremony and has in recent decades been adopted by pastry chefs and chocolatiers. From brownies to croissants and donuts, my new ‘Matcha Green Tea‘ food tasting tour unravels the history behind this enigmatic ingredient while sampling some of the best matcha-flavoured interpretations London has to offer. Alongside tasting plenty matcha treats and one hot beverage (all included in the tour price), the bohemian districts of Fitzrovia and Soho will serve as our vibrant backdrop. From little Dickensian alleyways to secluded courtyards, our exploration will also take in a charming toy museum, a former hat factory as well as an urban village filled with chic boutiques and art. Following in the footsteps of my ‘Macarons & Mews‘ and 'Piccadilly and Petit Fours' walks, this new food tasting tour adopts a similar concept: exploring the hidden corners of an iconic London area while visiting the location’s sweet(est) hotspots. This tour is aimed at seasoned Londoners as well as tourists who are looking for their sugar rush to come with a historical slant. A perfect gift for anyone with a sweet tooth, this walk can also be booked as a private tour for birthdays, weddings or any other special occasions. The meeting point for this tour is just outside of Caffè Nero by Whitfield Gardens, close by Goodge Street Tube Station (Northern Line). This walk finishes close by Piccadilly Circus Tube Station (Bakerloo Line and Piccadilly Line). While the length of the tour is advertised as 2.5 hours, please note slight delays might occur as we will be visiting shops during regular working hours. Including 5 tastings + 1 hot drink, the tour costs £20 per person and tickets are available for purchase on Eventbrite. All pricings for private group tours are available upon request. If you have any more questions about the walk or would like to organise a private tour, do not hesitate to get in touch with me either via EventBrite or send me an email directly to: yannick.pucci[at]gmail.com. You can also find me on Twitter where I’m always up for a chat too. An expat from Luxembourg, Yannick Pucci is an independent London tour guide and founder of London Unravelled. Constantly inspired by his adoptive city, Yannick is an engaging and enthusiastic storyteller and his walks were named as some of the ‘best London walking tours‘ by LastMinute.com. Combining his love for architecture and history, Yannick’s ‘Art Deco’ tours explore the sophisticated glamour and severe functionality of 1920s and 1930s design. His popular 'Art Deco in Bloomsbury' tour made its debut during the Bloomsbury Festival 2013 and has been the subject of a Londonist Out Loud radio interview. While ‘Art Deco in the Strand’ explores posh hotels and towering office buildings, ‘Art Deco in the West End’, his latest offering in the series, takes a closer look at cinemas, garages and retail spaces. Combining his love for sweet treats and history, Yannick has also branched out into food tasting tours. While ‘Macarons & Mews‘ explores the history of the (not so) humble macaron, ‘Piccadilly & Petit Fours‘, celebrates the foodie heritage of St. James's and Mayfair. His latest offering in this series, ‘Matcha Green Tea‘, investigates Japanese powdered green tea in Soho and Fitzrovia. For the past six years Yannick has also been volunteering at the British Museum where he has been facilitating object handling and delivering tours ever since, including the Japan eyeOpener Tour, the Highlights Tour and the WCEC 'Behind the Scenes' Conservation Tour. 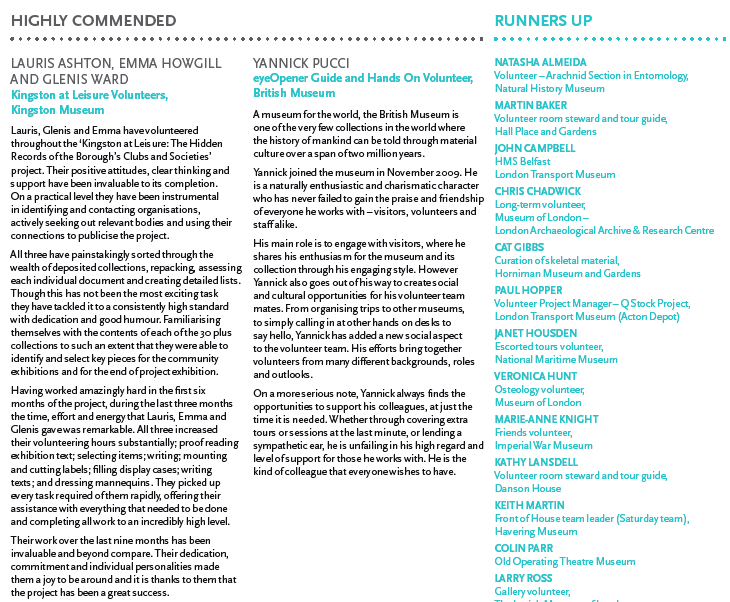 His team-building efforts have been highly commended in the Renaissance London Volunteers Awards 2011, in the category 'Going the Extra Mile'. In addition to running his own tours publicly and privately, Yannick has developed and led walks for the London Festival of Architecture, Open Garden Squares Weekend as well as for the Friends of the Royal Academy of Arts. You can find reviews of Yannick's walks on his website London Unravelled as well as interact with him on Twitter (@ypldn) and Instagram (@ypldn).